The Silent Epidemic is a global warning about the tragedy of brain damage caused by our social drug of choice – alcohol, and the hope of early screening, identification, and treatment. A child psychiatrist’s view from the halls of death row provides insight into the ice berg of prenatal alcohol exposure lurking below the waterline of social consciousness. The science of how alcohol-related birth defects happen – as early as the third week after conception – is interwoven with case descriptions in an easy to read manner. 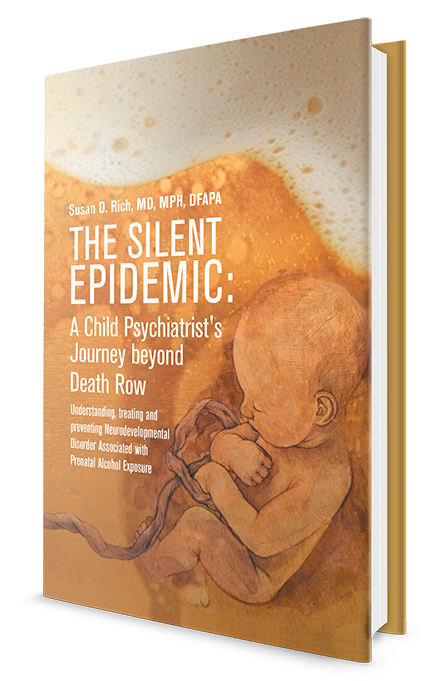 Dr. Rich introduces you to the Epsilons and Deltas who were exposed to moderate to heavy amounts of alcohol in the womb – from the backdrop of jails, prisons, and death row. Central to her theme is the concept that we must teach young people to contracept if they are using alcohol – much like dentists teach children to brush and floss to avoid cavities. As a child psychiatrist, she introduces hope to families and affected individuals in a treatment planning model she has found successful in clinical practice. Copyright © 2016. Susan D. Rich MD MPH DFAPA. All rights reserved.